Use sewage disposal facilities and prevent pollutants such as petrol and oil from entering the water. There are more than 700 historic shipwrecks in Victorian waters. Any ship that sank more than 75 years ago is protected by the Heritage Act 1995 (Vic) or the Historic Shipwrecks Act 1976 (Cth) and the regulations. Protected zones have been declared around nine shipwreck sites, six of which are in Port Phillip Bay. It is an offence to enter a protected zone without a permit. This includes fishing, trawling or any underwater activity such as diving within a protected zone. Further restrictions are described in the Heritage (Historic Shipwrecks) Regulations 2007 (Vic). It's also an offence to damage, disturb or interfere with any historic shipwreck. This includes anchoring on it or removing objects from the wreck. For further information on historic shipwrecks contact DELWP. 50 metres of a seal. Not come between a mother and her young. If a marine mammal approaches you – if a dolphin decides to ride the bow wave of your boat or if it takes an interest in your vessel, for example – you are not committing an offence. However, if you deliberately approach closer than the minimum prescribed distances you may be liable for prosecution. In a narrow waterway (that is, waterways less than 300 metres wide), you cannot approach closer than 30 metres to a whale or dolphin, unless navigating for safe passage. There are no restrictions on how close you can get to a seal in the water but a vessel must be kept at least 30 metres from a seal on land. There are restrictions on boating around protected areas and seal breeding colonies, how you operate your boat around a seal and approaching seals on land. Licensed tour operators are permitted to approach closer than distances detailed above, subject to a range of operating conditions. By taking these small steps, you'll not only be doing the right thing by the animals, you'll be helping to make sure future generations can enjoy the sights and sounds of whales, dolphins and seals for a long time to come. To view a summary of the restrictions in place for boating and swimming around whales, dolphins and seals, contact DELWP on 136 186 for a brochure. 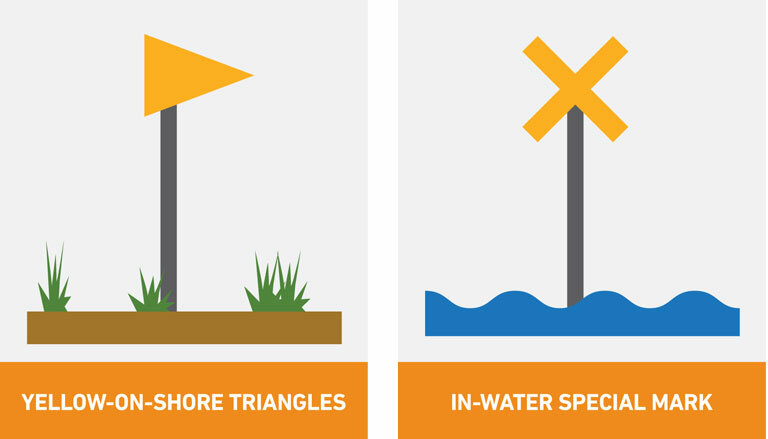 Nine offshore marine aquaculture fisheries reserves have been established in and around Port Phillip, marked by navigation aids with 'Aquaculture' written on the yellow 'X' crossbar. They are lit at night. Recreational users in surrounding waters should proceed with caution if near or entering the reserves. For further information contact Victorian Fisheries Authority. The Victorian Government has created a system of 13 marine national parks and 11 smaller marine sanctuaries to ensure that representative samples of Victoria's marine environment are conserved for future generations. All forms of commercial and recreational fishing from sea or shore are prohibited, including collecting bait, line fishing, setting traps, netting and the use of spears. Heavy penalties apply. These are located at the park boundaries and point in towards the marine national park or marine sanctuary. In some cases there are two yellow on-shore triangles located one above the other. These two triangles can be used to get a lead to the boundary by aligning the two triangles, one directly above the other. Detailed maps of boundaries are available from Parks Victoria and Victorian Fisheries Authority offices. These markers are found on buoys and piles and are used in waters to mark the boundaries of zones and other special areas.